Are you interested in the amendments the Ministry of Agriculture is preparing, changes concerning the entire market or food that is currently reported as hazardous? We are launching new web right for you; here you can find all information related to the issue of food. Let us present the independent portal focusing on food producers and retailers, restaurant operators and for those who want to be permanently informed about what is happening in the world of food. Practical web - www.iqsl.cz will provide you with all information on one place. 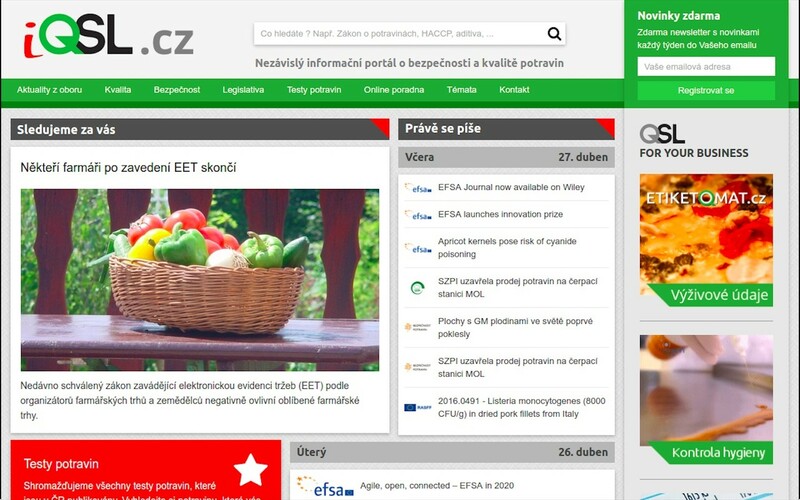 We draw on information from highly relevant sources: the Czech Agriculture and Food Inspection Authority, Ministry of Agriculture, Federation of the Food and Drink Industries, EU – RASFF, EU – EUFIC and State Veterinary Administration. We provide all news divided into several section of quality, safety, legislation, etc. Fast search by key words or individual topics is a matter of course. Are you interested in a particular issue? You can use our online advisory centre free of charge. On the web, you can find also testing of food processed by Blesk.cz DNES. You can be registered to receive all news in your e-mail box. All of that is available free of charge on www.iqsl.cz. We are glad to accommodate your needs. Therefore we appreciate your comments and observations.